Denying NHS services to patients who top up their care with private treatment is "untenable", according to a leading health think-tank. The King's Fund gave its backing to co-payments, saying the NHS risked being seen as uncaring if it did not. The current rules mean patients will be excluded from NHS care if they pay privately for drugs not available on the health service. But a review is being carried out in England after protests from patients. Cancer tsar Professor Mike Richards is looking at the issue for minsters. He is due to publish his recommendations in October, which Wales and Northern Ireland have said they will monitor "with interest". Scotland has already announced a review, although it is specifically on cancer drugs. The Department of Health had originally argued that allowing a system of co-payments would create a two-tier service. 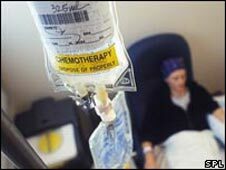 But ministers agreed to reconsider the issue after high profile coverage of patients being excluded from care for buying life-prolonging drugs for cancer. The King's Fund said continuing with the rules would be untenable. In a statement, the think-tank pointed out: "There are areas of the NHS where there is inconsistency over patient charging, such as optical care and dental care." The King's Fund accepted it was a "difficult decision", but said to continue with the ban risked "damaging the reputation of the NHS as a caring and compassionate service". But the group did say that if patients wanted to pay for drugs not available on the NHS, then they should also pay for any associated treatment. For example, many of the drugs not available on the NHS have quite severe side-effects that need managing. The King's Fund also addressed the issue of what to do if a patient's money runs out but the drug was giving them benefit. It said there should be a set time period after which the NHS would agree to fund the drug if it was sufficiently effective. One of the major reasons for rejecting a drug in the first place is that it does not work for everyone. It comes after bodies such as the NHS Confederation, which represents managers, and the British Medical Association have remained fairly neutral on the issue.